I don't sew. I don't like to spend a great deal of time on homemade costumes and projects. Pretty much all DIY costumes I make are put together with a hot glue gun! 1. Cut the tomato cage to the appropriate size. Remove the bottom pieces - you don't want the metal portion of this costume to come down past the bum, so that your child can still sit and walk. Cut off top rows of cage based on height of child. 2. Cover sharp edges. Slice open pool noodle on one side and cover top ring. This covers any sharp areas and also makes a shoulder cushion. Use tape to secure pool noodle. I covered the bottom ring with bubble wrap. Use tape to secure bubble wrap. 3. Add shoulder straps if needed. I found that the open area at top was just a little too wide to rest on my son's shoulders properly. I added two pieces of 1" ribbon across the shoulder area. Just time eem' and knot em'! 4. Cover outside of cage in felt. Use hot glue to secure. 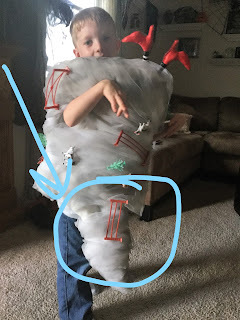 Add more felt as needed to create your "fluffy" tornado shape. Use hot glue to secure. I didn't use fill here because it is harder to secure with hot glue. When making the bottom part of the tornado, put it only in the front so that the child can still move their legs. Cut arm holes after covering. 5. Wrap cage in tulle and secure with hot glue. Wrap, wrap and wrap some more. Until you've achieved the spinning tornado look. 6. Spray paint entire tornado. I used a little black to get the grey color. 7. Add details (optional). We grabbed some farm animals from the dollar tree and hot glued them to the tornado. 8. Put it on and SPIN! Tada! You have a Tornado Costume! Happy October from the Maglich Family!